Dr. No's interior configuration has been designed to comfortably accommodate up to 8 guests overnight in 4 cabins. She is also capable of carrying up to 2 crew onboard in 1 cabins to ensure a relaxed luxury yacht experience. 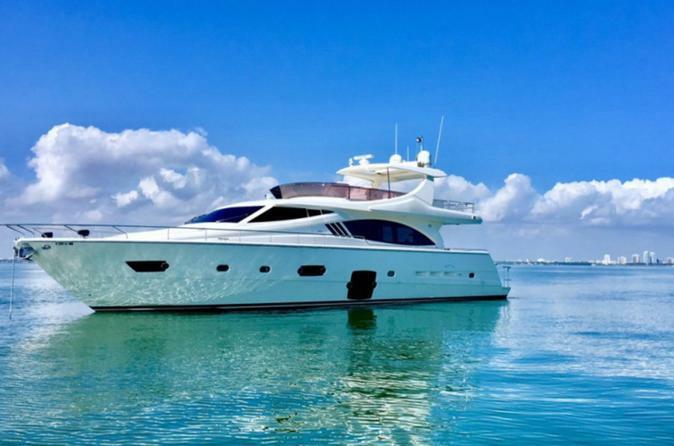 Her fantastic outside spaces make her the ideal choice for a luxury yacht charter in Miami. Spend a day on the beautiful Biscayne Bay, where the knowledgeable captains will guide you through the many islands while providing commentary on the scenery. The experienced stewardess is also on board to cater to your every need so you never have to lift a finger. When you are finished learning about the area, drop your anchor and swim or jet ski. All of theÃƒÂ‚Ã‚Â yachts are stocked with popular watersports equipment, and more can be provided depending on your needs. For total relaxation, be sure to contact the supplier beforehand.